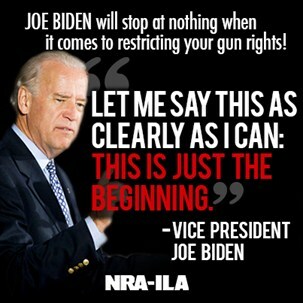 NRA-ILA | Biden: Gun-Ban Legislation "Just the Beginning" -- Pelosi: "Not the End of the Day for this Issue"
"I've been to a number of states since this Congress has gone in and many parts of different states and the public is so far ahead of the Congress on this subject. I believe whatever passes in the Congress now will not be the end of the day for this issue." The anti-gunners see momentum from tragedy as an asset. They believe that momentum is now on their side. And they clearly intend to press that perceived advantage to promote their agenda. They don't care that polling data contradicts them or that past experiments with the same type of legislation have failed. For them, the real goal is restricting firearm ownership in America--as much as they can, however they can, and whenever they can. "This is a very big deal for the public," Pelosi concluded. "But again, it's a legislative body, and we have to go forward as boldly as we possibly can, and I would not say, well, if the assault weapon ban isn't there that that means less is going to happen down the road. I think it means more should happen up the road as we go forward." Please be sure to contact your elected officials today, and respectfully urge them to protect our Second Amendment rights. Ask them to oppose anti-gun legislation, especially Sen. Charles Schumer’s (D-N.Y.) S. 374, the "Fix Gun Checks Act of 2013"--which would criminalize virtually all private firearm sales, even temporary transfers-- and Sen. Dianne Feinstein’s (D-Calif.) S. 150, the "Assault Weapons Ban of 2013." To identify and contact your legislators in Washington, D.C., you can use the "Write Your Reps" feature at www.NRAILA.org, or you can reach your member of Congress by phone at 202-224-3121.